This is a crater lake located in the mountain area at a distance of approximately 20 kilometres from Chamarel. 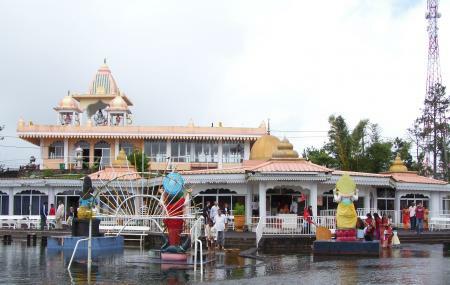 At a height 1800 feet above the sea level, this is a scared place for Hindus in Mauritius. The temples dedicated to Lord Shiva, Lord Hanuman and Goddess Laxmi grant the grand Basin the serenity and tranquillity. Hundreds of devotees walk to the temple bare feet and the Hindu festival of Mahashivratri is a highlight of the temple. It is celebrated in the temple from 1897. The new feature of the Ganga Talo is the 33 metre tall statue of Hindu god Shiva which is the replica of the Shiva Statue of Sursagar Lake in Vadodara. It was inaugurated in 2007 and is the highest known statue in Mauritius. How popular is Grand Bassin? People normally club together Trou Aux Cerfs Volcano and Black River Gorge National Park while planning their visit to Grand Bassin. Stunning religious place to learn more about Hinduism and history of the island including beautiful views and peaceful atmosphere. Such a nice and beautiful religious place. if you are from India you will like you are in a temple in India itself. Must visit place for tourist visiting Mauritius. You will feel as if you are in India. The place is well maintained and worth visiting. Overall a nice experience to see such a place in a foreign country. Very religious and pious place. Holy, Peaceful and amazing place!! 🙏 Respect and imbibe the good vibes..
A little bit crowded. Would seriously advise tourist to dress more appropriately, and not wear revealing clothes, as it is a sacred place for Hindus.